I loved the fact that this property is right near the water. I am going to get a room facing the ocean for our next stay. I too like the fact that it is not too crowed wuth a lot of people versus other big property. Very attractive older place well maintained. Staff especially helpful and friendly. This property is amazing! They greet you with a lei! It is absolutely beautiful grounds flowers, birds and beach. The pools are awesome. The food is so good, clean and great quality! Fresh water everywhere! It is the perfect place for a relaxing, inspiring renewing vacation! Checkin at 4 and checkout at 10! Also $18 to park. Grounds, personnel quite likeable, pools could be warmer and deeper. Gorgeous resort - beautiful grounds...perfect location. Our stay was pure heaven! We really enjoyed the property. The restaurant was excellent and our room was clean and inviting! 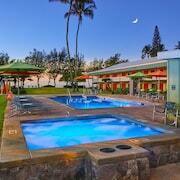 Great location, ocean view rooms, free bikes, nice pool and lawn. Breakfast could be improved.